As I detailed in my previous post about the current flooding in the UK, the main focus at the present time should be on protecting lives and property. It is certainly not the time for blame and is too early to attempt to learn lessons from the flooding or the response to it. That said I’ve seen quite a few articles and comments that the UK needs to learn from the Dutch in terms of flood defence. This seems an especially compelling argument in the case of the Somerset Levels where there seem to be many parallels in a tract of land close to, or below sea-level and criss-crossed by artificial drainage channels and pumping stations. With that in mind local MP Ian Liddell-Grainger visited Strasbourg two weeks ago to talk with Dutch politicians. I happen to agree with this assessment, we can learn a lot from the Dutch; however I think there are a lot of misconceptions about exactly what Dutch flood risk management entails. I thought it would be interesting to take a more detailed look at flood risk management in the Netherlands. It seems as if the perception of the Dutch water management programme within the UK is stuck in the pre-1990’s. 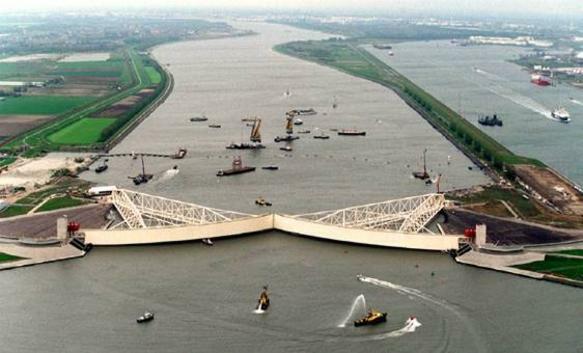 People seem to believe that hard engineering is still king in Holland and that the river and sea is forced back and kept out. Nothing could be further from the truth. I hope to give a brief look at how the Netherlands is responding to climate change in respect of flood risk and show that this is in no way as simple as many UK commentators would have you believe. I think most people would probably be aware that the Netherlands consists of large tracts of reclaimed land, which is often below sea level, and by as much as 6-metres in place. It is effectively part of the delta of the Rhine-Meuse river system. Much of the land is protected by an extensive system of dikes, creating tracts of land called polders, which are farmland below the level of sea/rivers and which rely on pumping stations to keep them drained and to move flood waters off the land (in a similar way to the Levels). This extensive network of man-made drainage and reclaimed land which was started in Roman times leads to the nice saying “God created the world but the Dutch created Holland”. The recent storm surge on the East Coast of the UK, accompanied by dramatic pictures of the tidal barrier on the River Hull nearly overtopping were compared to the most devastating storm surge of recent times, that of 31st January 1953. In Holland this same storm surge is called simply “Watersnoodramp” (The flood disaster); whilst 326 died in the UK, 2551 people lost their lives in Holland. 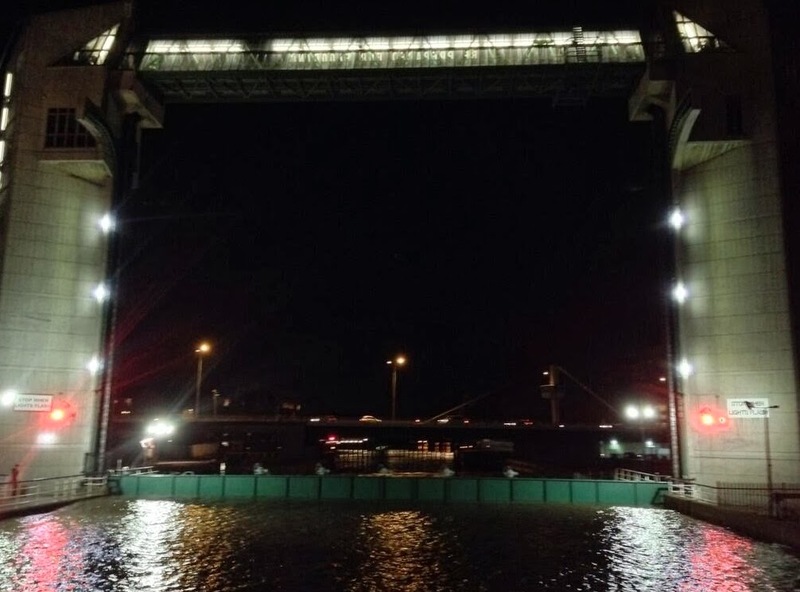 This disaster led to an overhauling of the Dutch approach to flood defence including the construction of the iconic Maeslant barrier (pictured above). It is this image of the Netherlands as a nation with impregnable hard engineered flood defences and water management that make sure water goes where it is supposed to and does what it’s told that people have in mind when they advocate learning lessons from Holland or getting Dutch flood defence expertise into the UK. However this image is out-dated. For over ten years the Dutch have been embracing a new approach to flood risk management marrying the best of their engineering expertise with more flexible management of flood waters. The reason behind this rethink is climate change; over time the Dutch have been building their dikes higher and higher but realised after flooding in the 1990’s that higher dikes meant more devastating floods when they failed. Not only that but drained land behind the dikes is subsiding (and is thus even lower). There is an explicit recognition in their policy that rainfall is and will be harder and more frequent. They have therefore begun to instigate managed retreat of some land, along with upgrading, rebuilding and improving flood defences. One example of such a project is Ruimte voor de rivier (Room for the river), the objective being to give the river at 30 locations more room to accommodate higher water levels, essentially allowing the river to flood safely. Work includes the dredging of river channels but this is only a small aspect of the plan. In Nijmegen a new relief channel is being cut for the River Waal 200m wide and 3km long, along with moving back the existing dikes; this has involved the demolition of 50 houses. The floodplain will be park and recreational ground to allow safe flooding. This is a huge change to a 2000 year old city. Plan for Overdiepse Polder designed by Bosch Slabbers – farms are demolished and rebuilt on large mounds. Another component is “de-poldering”; lowering/removing the dikes in some areas of farmland and designated in the land as a flood zone. The inundation of these former agricultural areas during flood events will protect towns elsewhere. In other areas retreat is being managed by protecting farm houses and acknowledging the farm land itself will flood. This is being done by demolishing the existing farm houses, constructing giant man-made mounds (~20 acres each) and rebuilding farm houses on top of them (hopefully) higher than the flood waters will reach (~7-8m high). One example is Overdiepse Polder, where 16 farms have been designated as flood zones to protect 140,000 residents of Den Bosch. As the New York Times put it “By displacing farmers.. residents in that city can breathe a little easier.” Individual houses are also increasing being built to be flood resilient in novel ways, including building floating, or amphibious houses. A new floating home installed by Deltasync in Delft, Netherlands, Dec ’13. So, can we learn from the Dutch about flood control? Undoubtedly. In certain respects they could be said to be 10-15 years ahead of the UK in aspect of flood risk management. In the case of the Somerset Levels, experience from Dutch water managers could be very helpful. However, it is disingenuous to cherry pick one small part of a comprehensive and resilient flood risk management plan such as “room for the river” (dredging) and suggest applying it would solve UK flood problems. The “Dutch approach” to flooding specifically on the Somerset Levels would likely involve widening and deepening the Tone & Parrett (through dredging) as well as abandoning large tracts of farmland as flood zones and the demolition and relocation of existing farm houses onto large mounds. Make no mistake such a policy was not immediately popular in the Netherlands, as I suspect it would be unpopular in the UK. Another consideration is money, the Dutch have earmarked €100bn through to 2100 to cope with sea-level rises of 1.3m. This is for 451km of coastline. The UK has a longer coastline than countries such as Brazil and India at 12,429km. If we were to match the Netherlands € for €, km for km, that would be about €2.8 trillion by the end of the century purely on coastal defence (no river defence). This is obviously a silly example, as much of our coast is hard cliffs which need no defending, but it does illustrate the vast gulf in scales between Holland and the UK. It also illustrates the current spend of €0.67bn a year for all flood defence (coastal & inland) is woefully inadequate. The most important advice we can take from the Dutch experience of flood risk management is that you need to be adaptable, open minded to changing historic land use patterns and prepared to take radical solutions. The climate is changing and flood risk management practises will have to change with it. This entry was posted in Flooding, Geomorphology, Hydrology, Politics, River Management. Bookmark the permalink. You talk about 451 km of Dutch coastline. But are you aware that the Dutch have 17.500 km of dykes in their country to manage and to maintain. After the build of the Afsluitdijk the water management in side the Netherlands ofcourse did not disappear. The risk is not only coastal defence. The rivers and the need to be able to stall temperaly water for weeks is as important. I live in the middel of the country but in the small watership I live in, we have already over 700 dyke watch volunteers who guard the dijkringen 10,11,53 . So it is not just coastal. Brittan has a way easier job on protecting it’s low areas, because these areas are not that low in the UK. I live in a polder under sea level made dry around 1336 and thousends of humans and animals died during many floodings in that area. Hell, even the Germans put it under water again, to prevent allied landing during WO2. And the people here allways recalculated, pumped the water out with hundreds of mills (later steam engine driven pumps, followed by electra driven), rebuild the dykes. Many of the old farmes are build on terps (hills), but nowerdays thousends live in the polder not on hills, so the damage would be way and way higher. And the floodrisk here is once in 2000 (or some parts 1250) years, which a high risk for Dutch standards. If the sea level rises, or more water comes from the Alpes that projected….. that risk rises fast. So it is fluctuating. So the UK will not be done, even after they build hundreds of dams/dykes. It is someting to recalculate and remeasure and reinvest…. througout time. If we would have had the same huricans like in South USA or earth quakes like in Japan, the Netherlands would simply not exhist the way it does now. So it is weather pattern related how you can manage your lands. In the end living under water level, is just a matter of calculation. Is it economicly interesting to invest again and does the risk way up to what you can gain of the lands. What most forget (or not many media mention it) is that the Netherlands works with so called “dijkringen” (dyke rings). Dijkring 13 and 14 (the 2 provinces south and norh Holland with Amsterdam and Rotterdam in it) are protected on a level of a floodrisk of 1 in every 10.000 years ,(with the current water level). However the other dijkringen in the Netherlands have a way higher risk to be flooded. So they calculate how many people live inside an area, how many industry is involved…how important is the land….. and they connect a riskfactor to it. But the fact that one day these low leveled areas will flood will not change. And that knowledge, or understanding ….. is the essential part of living near water. If the water rises, it will flood again. Just simply rebuild and claim or move. We live temperarely on this planet. The Dutch maybe do understand that better then no other. Anne, thank you so much for the comment. It really helps to understand the realities of living “inside” Dutch flood defences and especially the importance of the way it is necessary to think about floods. Do you think the “mindset” in Holland has changed much since 1990’s as new projects like Ruimte voor de rivier have started/been completed? The way that the Dutch systems seems (you never can guarantee that the Netherlands will not be flooded) to be working, is also mainly the importance of the water boards. In the end politicians decide in most countries where the money is spent. In the Netherlands, they prevent political issues by having these water board seperated from the national government. Off course the biggest project are financed by the government as well but the water boards collect there own tax to prevent the land from flooding. They even have there own elections. This makes it easier in the Netherlands to defend the country for flooding. I noticed here in the UK and the comments on twitter, that in the UK the government blames the Environmental Agency, while they complain about the budget cuts. If you want to prevent your country for flooding, the Environmental Agency should not have to depend on the government. I think each country will be able to defend itself against floods as there are enough smart researchers and engineers in the UK to solve the problems. It is nice that journalist show the Netherlands (for my Dutch ego) as an example, but it all depends at the end on the money that people are willing to spend on their flooddefense. I forgot to mention the role of ‘Rijkswaterstaat’, which is the executive agency part of the Dutch Ministry of Infrastructure and the Environment. Its role is the practical execution of the public works and water management, including the construction and maintenance of waterways and roads, and -importantly- flood protection and prevention. They are more involved in the large projects, like the Deltaworks. I probably forget a lot more institutions and their role in flood protection, I am not an expert. I only wanted to point out that only looking at flood defenses and adaptavie solutions used in the Netherlands is not only the key for long-term flood protection. I live in Guwahati (Assam) India. The city gets flooded with the first shower in the monsoon. Can Rijkswaterstaat hhelp in improving the situation? Let me have the contact e-mail ID and name/phone nos. À very interesting article how’s explain the dutch solutions for water management. And I will put in some help. Our company has developed dike stones (Hillblocks)how’s reducing the wave run up with 30%. And ower Grass-block protecting, for dike collapse by flooding. For more information see ower website.